Obviously as I've stated in previous blog posts Paul Stanton is running for Senate here in Florida. He's running on a platform that "Freedom is for Everyone". From my personal interview with him I can say that he's focused on decriminalizing drugs, and creating a system of rehabilitation rather than ruining lives with our current legal system. He's heavily focused on lowering and limiting taxes, blocking unfair bills in Congress, and strongly believes in a system which does NOT use force. He is a computer programmer, veteran and Libertarian activist. I'll be voting for him, and am proud to endorse him. Rob Lapham is running for U.S. House in the 2nd Congressional District. To be clear his district is down by Tallahassee and Panama City, so I can't vote for him. But if you live anywhere on this map I think you should! Rob promises 15 things on his campaign website: To never expand big government, downsize the military, shut down the TSA/NSA/mass surveillance and end the drug war are amongst them. Ken Willey is running for State House in District 18. He doesn't have a campaign page, but you can follow him on Facebook to learn more about his platform. District 18 is over by Palm Beach to be clear, so if you're in that area. He's a Libertarian you can vote for. Artie Lurie is running for State House in District 90. He claims to be a vote for Liberty and Small Government. He's for tax reform and responsible gun ownership. He's been a member of the Libertarian Party since 1996 and has been living in Florida since '94. I encourage you to research those running in your county. If they aren't "Libertarian" I highly recommend reaching out to them for interviews to see if perhaps they lean towards liberty but have caught in the bi-partisan net. Let's start with his live tweets during the debate this week. I did not think that #debate number 2 could be more pathetic than debate number 1 and yet to this point, it is. I'll add to this later when I have some more time to go through his twitter, but I encourage you to follow him and check him out yourself. 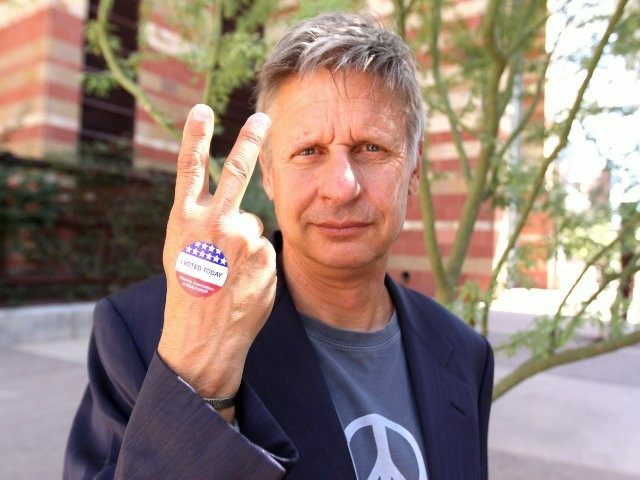 The former New Mexico governor will almost certainly win the highest vote percentage of any Libertarian Party candidate in history. The title is now held by 1980 nominee Edward Clark, who earned 1.06 percent of the vote (his campaign was buoyed by the checkbook of his running mate, David Koch). There is some question as to what his polling numbers really look like right now. There have been reports that "millenials" those aged 18-35 are being excluded from the usual reporting numbers, as well as military personnel. As most of you may know, those are the groups Gary Johnson and Bill Weld perform best in. Whether this is some kind of conspiracy to make Gary look bad, or just "the way things have always been" I leave up to you to decide. The fact of the matter is Gary was polled at 39% amongst active duty, beating out both Hillary and Trump. Among Marines, Gary was at a whopping 45%. However, despite Clinton's underwhelming performance among active duty troops in the poll, their family members preferred Clinton at 29 percent to 27 percent for Trump. Johnson came in third, at 24 percent. I found varying results when looking for polls specifically targeting millenials, but across the board the numbers showed that Trump was losing ground in that age group, and Johnson was atleast beating the Republican nominee, and sometimes Hillary as well. If Johnson can snag 5 percent of the national popular vote, the Federal Election Commission will HAVE to classify the Libertarians as an official “minor party,” granting the 2020 nominee a lump sum of cash for the fall campaign, courtesy of the American taxpayer. While we're anti-taxation, we're going to need to recoop some cash after these campaign costs. National recognition is a huge deal for our party, which has been struggling for years to gain media attention, and to be acknowledged as more than just tin-foil hat wearing conspiracists. Meeting the threshold would at least guarantee the part a 10 million dollar pay back, more if we gain more of the popular vote. That may seem like very little compared to the hundreds of millions of dollars major party presidential nominees routinely raise, and spend. However, our boy Johnson has gotten this far after raising only $8 million through August. Knowing the Libertarian Party’s nominee is guaranteed $10 million will allow him or her to hit the campaign trail running, improving the odds of getting into the debates, winning an even larger share of vote and fortifying the party’s place in the American political landscape. With Trump's campaign in a tail-spin it may look like Hillary has this election in the bag. But, win or lose, for the Libertarian Party, all we really need is 5% of the popular vote for this to be a major win in our history. Maybe this isn't going to be our year, although I truly still hope the electoral college works in our favor. But if it's not our year, it will at the very least be the beginning of a true revolution. Keep fighting ladies and gentleman. Let's get liberty and justice for all.